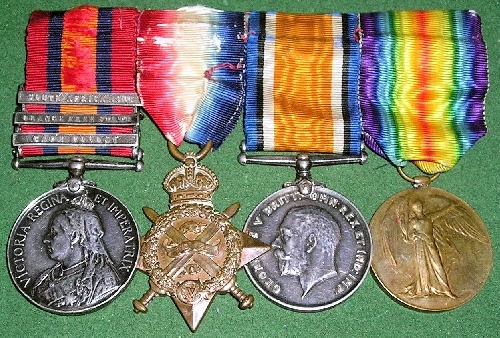 QSA 1899-1902 WITH CLASPS: CAPE COLONY, ORANGE FREE STATE & SOUTH AFRICA 1901 and 1914 Star Trio. Walter Harrison Rogers enlisted in the 4th Militia Bn. of the Derby Regiment on 25/9/1899. He was captured and disarmed at Roodeval on 7 June, 1901. He landed in France on 23 August, 1914 with the 4th Divisional Ammunition Column. The man captured 12-02-1902 was Pte 5111 A Rodgers Derby Rgt. Pte 7158 did not serve in 1902, he only earned the 1901 date clasp.